I'll be honest here, I hated Greenslade as a teenager in the mid-seventies. They played five times at Friars club in Aylesbury, where I lived. I didn't go to any of the gigs and I loathed the boys who carried Greenslade albums around under their arms at school. I was certainly not into "prog-rock" whatsoever. It was completely anathema to me. However, time is a great changer. In recent years, I have begun to wonder what it was those boys liked so much and have started listening to stuff like this, along with The Strawbs, early Supertramp and Mike Oldfield. No ELP or Yes as yet, though. There are limits! Maybe I'll dare to dip my toes into those murky, incense, "loons" and cheesecloth waters at some later point. 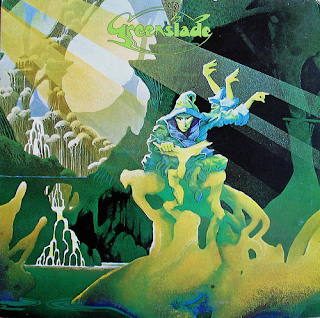 Greenslade were formed by keyboardist Dave Greenslade and the eschewed the use of electric guitar, being just keyboards drums and bass (although I am convinced electric guitar turns up on at least one of the tracks on this album. The music is largely instrumental, yes there are vocals, but they sort of float in and out of songs without every annoying me too much or dominating the song. It is the instrumentation it was all about and I have to say that the material is not all typically prog-rock in sound or mood. There are definite blues influences in places, and even funk and jazz influences cropping up. 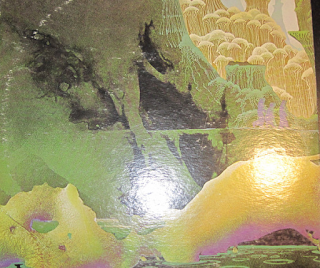 For that reason I find it easier to get into this album and appreciate it more than others in the prog genre. A lot of the music is very laid back and, dare I say, ambient. After a couple of listens, you get quite hooked on it. "Feathered Friends" begins with an almost funky rhythm and is driven along by a melodious bass line. It has the usual proggy changes of pace and mood throughout its seven minutes and the vocals are very typically prog in that high-pitched, nasal and dreamy fashion that so many of its exponents seemed to sing in. "An English Western" is a shorter track with some archetypal prog organ swirls. "Drowning Man" is a bit Pink Floyd-esque and not a little pretentious in its quasi-religious "forgive us our trespasses" lyrics. As always with prog-rock, though, a sudden change of pace can yield a different feeling, and the song bursts out of its somnolence half way through, with some rhythmic and inventive organ, bass and drum interplay. "Temple Song" is a short, very late sixties song in feel with some delicious bass, cymbals and keyboards interaction which all most betrays psychedelic jazz qualities in places. "Melange" is my favourite track on the album. I am sure there is electric guitar all over this one, from its chunky opening riffs to its electric guitar-sounding extended ending. Maybe Dave Greenslade reproduced the sound somehow on his keyboards, but it sounds very guitar-ish to me. Maybe it is bass and electric piano? Either way, it is a superb track, with intoxicating cymbal work, bass and organ. Some floaty trippy backing vocals are there too, plus some great bass. Really impressive. Very "ambient" to use current terminology. This stuff could be sampled. "What Are You Doin' To Me" sounds quite like Argent to me. It is one of the heaviest, rockiest cuts on the album. There are slight airs of Steely Dan in places, would you believe. Only vague ones though, but they are there. Something about the vocal tone at times. "Sundance" is the final track on the album, and an impressive one it is too, beginning with some classically-influenced piano before kicking into some serious heavy rock passages with Greenslade's organ swirling around all over the place, together with some spacey keyboard interjections. It ends with some full-on Deep Purple organ-driven rock. I have to say that this remaster, while having an excellent, sonorous bass sound throughout, is also a little bit muffled, drum-wise. Maybe that was how it was originally recorded and will always remain so. It is notable how the second CD of "live at the BBC" material from the album actually sounds less muffled and much clearer and defined. The sound on these are truly superb. I almost prefer listening to the album this way ("What Are You Doin' To Me" is that only one not played live) The tracks are all exceptionally well played, showing what a good live band they were, although the thought of seeing them in concert in the seventies filled me with horror at the time. As regards the cover art - stuff like that was partly responsible for punk!